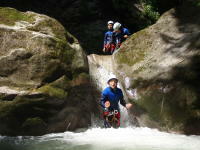 Discover this whitewater activity in a natural protected environment near Annecy. Only fun and intense sensations. Pure happiness ! 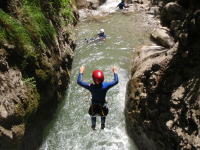 Come and enjoy the most beautiful canyon of the region. This course is the most accessible physically, and is totally adapted for families, beginners and seminars. On this course, a double zipline brings you to the canyon. 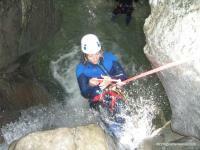 Then it is a discovery course, similar to the matinal one, the most physically accessible. Totally adapted for families, beginners and seminars. This wild and aquatic canyon of Montmin is a reference in the region. It's a perfect course for a first time experience or a recurrence. Good atmosphere and sensations guaranteed ! 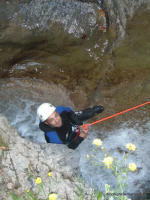 You are looking for a technical and sensational course, with impressive rappelling ? This canyon is for you ! You will also get to enjoy beautiful aquatic parts within breathtaking landscapes which won't disappoint you! 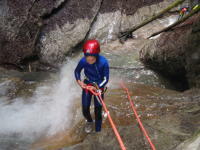 This innovative course is a mix between Montmin's Canyon, with a zipline and a 30 meter high abseiling within a sensational waterfall. If you are sporty, this canyon is for you ! !